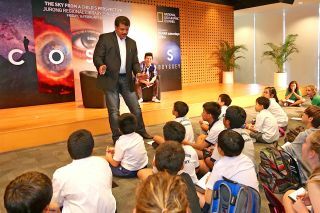 Neil deGrasse Tyson speaks to students at the Jurong Regional Library in Singapore to promote his television series, "Cosmos: A Spacetime Odyssey." The success of science depends on the ability of scientists to successfully explain their subject. It depends on the talent of professionals who can popularize science in the media, where education and entertainment can become one. Such individuals include Carl Sagan and Richard Feynman, among many others, whose enthusiasm is contagious, whose videos still attract millions of viewers and whose viewpoints still enlighten minds around the world. Add Neil deGrasse Tyson to this list, thereby creating a trinity of physicists and astrophysicists with the ability to translate the prose of science and mathematics into poetry better suited for mass communication. Tyson is the host of the television series "Cosmos: A Spacetime Odyssey," a follow-on to Sagan's 13-part miniseries "Cosmos," which aired in 1980. Tyson's show will return for a second season in 2019. This announcement, from Fox and the National Geographic Channel, is important for three reasons. Second, Tyson has shown that a great teacher is a theatrical one. Just as there are equations that express the laws of physics, there is a law governing how to produce a hit TV show about the physical world: Show, don't just tell. Show us how the science works in a way that will capture our attention, using graphics and animation to illustrate the narration. Third, Tyson shows us how to apply what he showcases. He conveys the wonders of the natural world by reveling in the pleasures of science and the process of finding things out. Therein lies the message of "Cosmos": that science can be fun — that science is fun — provided we approach it with a sense of curiosity and wonder, provided we aspire to convert our dreams into deeds of daring and discovery, provided we attempt to achieve our ambitions and never cease to dream of exceeding our expectations. Teachers who want to increase students' interest in space and emulate Tyson's teaching style can start by adopting a free space-focused curriculum from my company, DreamUp. When educating students about something so esoteric, it helps — it is essential — to captivate minds with captivating materials. I look forward to watching the second season of "Cosmos," and I hope you'll join me in finding out what Tyson has to teach us next!